Thanks to Mark Johnson’s inspiration, the original Technote 31 was written by Red Harlan way back in March of 1989, and the Dogcow –– that lovable little critter aptly named Clarus –– was brought to life. The rest, of course, is Dogcow history. In the span of seven years, the Dogcow has gained almost mythological status, serving as the de facto mascot and torchbearer for legions of Apple Developer Technical Support engineers. And its magic continues to this day. This Technote attempts to document the Dogcow’s various and sundry exploits –– most recently, in the world of QuickTime VR. Indeed, some might say that the Dogcow has “gone VR.” In any case, this Note looks at some of the Dogcow’s history and peregrinations and then explains the technique for creating a QuickTime VR object movie with the Dogcow as star. Could a part in the next Babe movie be far behind? Stay tuned for details. DTS engineer Brian Bechtel has been the guardian of Dogcow history, creating and maintaining a great Web page, entitled “A nest of Dogcattle,” at <http://dev.info.apple.com/dts/dogcow.html> with a compendium of links to documents that detail the wonderful history of the Dogcow. Check it out! The history is explained in, among other places, two issues of develop, #17 and #18. Point your browsers to Brian’s Web page, which is must-reading for all Apple developers who want to keep up with Dogcow lore. The Dogcow has certainly grown by leaps and bounds over the years, starting out as a character in the original Cairo font designed by Susan Kare. 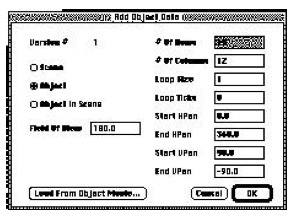 Figure 1 shows Clarus, christened by Mark Harlan in 1989, as a trademarked icon in Apple’s printer driver Page Setup dialog boxes. Figure 2 shows the Dogcow flexing her “FatBits,” as it were, and getting bigger. Figure 2	The Dogcow flexing her FatBits. 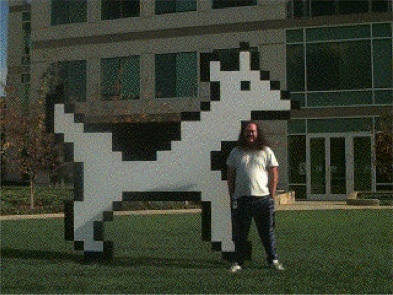 Figure 3 shows the Dogcow becoming even larger than the largest known DTS engineer, Dave Polaschek, and appearing along the way as a “lawn creature” on the Apple R & D campus in Cupertino, California. and appearing as a lawn creature on the R & D campus. Click on the QuickTime movie icon to download the Moofie.MOV file. It’s only 32K in size. 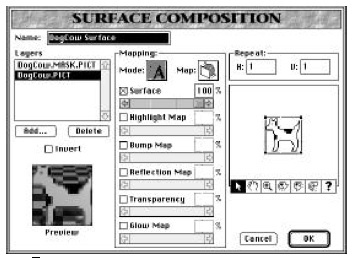 An incorrect FatBits version of the Dogcow in Macintosh Technote 1019, “Plotting Small Icons: The ‘SICN’ Resource” is shown in Figure 4. Note, according to DTS engineer Ray Chiang, that it appears like a Dogcow puppy because the proportions are different. Did the Dogcow actually have progeny? Hmmmm. What a trooper! The Dogcow has been put to work (by Your Humble Technote Editor) carrying a filing cabinent of archived Technotes. This is quite an accomplishment for a two-dimensional object; note that the filing cabinet is a three-dimensional object. The filing cabinet originally had no belt wrapped around it as it does now. Mike Marinkovich, a prodigiously talented DTS engineer, suggested in a flash of brilliance that a belt was necessary. So we had one custom tailored by a belt manufacturer, just for Clarus. The belt extended all the way around Clarus’s belly. But after a lengthy debate among DTS engineers and managers, it was decided that no belt was necessary after all! Figure 5 shows the Dogcow performing extra duty, archiving the 350 “old” Macintosh Technical Notes. Figure 5	The Dogcow, hearty soul, archiving the “old” Technotes. 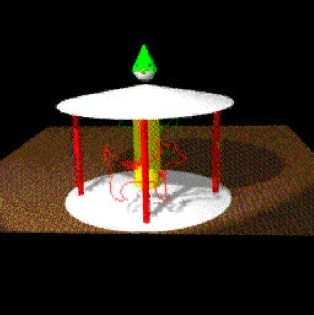 Figure 7	A screen from Guillermo’s classic Dogcow Merry-Go-Round QuickTime movies. Note: These two classic QuickTime movies are no longer available on the Developer CD series, due to space considerations. (Yeah, believe that?) If you would like to see them restored on the DevCD, please contact Dave Johnson at Johnson.DK@applelink.apple.com. You’ll need the QuickTime Movie Player to play these. Be sure that you have it installed on your system. Guillermo wishes to thank Scott "ZZ" Zimmerman for his long hours of work in rendering these images and creating the sound. In an effort over a single weekend, George Warner, another prodigiously talented DTS engineer, created with the help of Joel Cannon, DTS’s resident QuickTime VR guru, an absolute marvel: the first VR Dogcow movie. The techniques for doing this are explained in this section. You’ll also need the QuickTime VR Player to play the movie, which you can download from Apple’s QuickTime VR Website at <http://qtvr1.quicktime.apple.com/Install.htm>. Figure 9	Four PICTs you need to create, with masks of the Dogcow and grass. Figure 10	The Dogcow standing on the grass. Starting at the top of your object, record a movie of one rotation. Move the camera down 10° and point it at the Dogcow. .
Move the camera down 10°, point it at the Dogcow, and record another full rotation. Repeat this until you’re at the bottom of the object. You now have 19 movies of 36 frames each. Using MoviePlayer or Adobe Premiere, paste all of these into a single movie and save it flattened. You now have 36 frames/revolution for 19 revolutions for a total of 684 frames. Drag this movie and drop it on the “Make QTVR Object 1.0b1” application. Press Command-1 to add object data to the movie, as shown Figure 11. To add surface for the Dogcow and the grass, use a mask layer to set the transparency. Import the Dogcow mask generated in Step #2. Set mapping mode to Copy and the repeat to H:1, V:1. Also set the transparency to 100% and invert. Now import the Dogcow PICT from Step #2 as the second layer. This layer will be in mapping mode Reveal, and the repeat is H:1, V:1, with no transparency, and no invert. The grass surface is generated the same way, using the appropriate pictures from Step #2. Thanks to Brian Bechtel, Joel Cannon, Ray Chiang, Rand Crippen, Frédérique Courard Hauri, Mike Marinkovich, Guillermo Ortiz, Dave Polaschek, Sunny Singha, and George Warner.